Húsavík is a quaint fishing village on North Iceland’s Skjálfandi Sound. 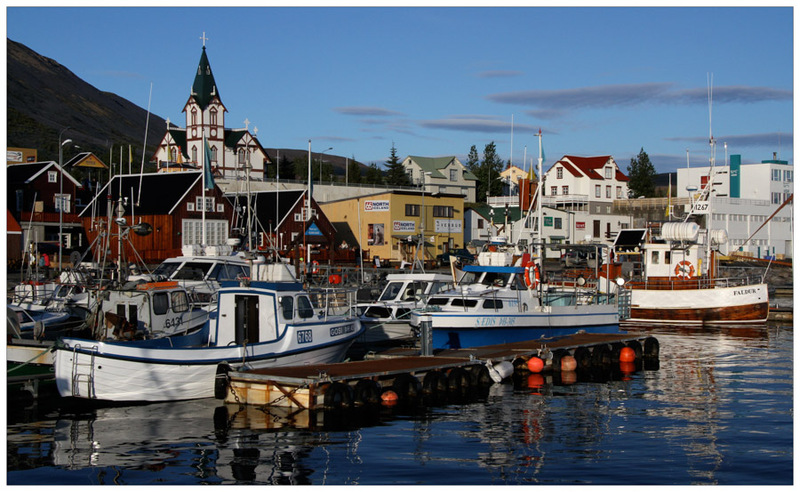 The village’s ornate wooden church sits perched above its picturesque harbor, and it’s a lovely spot to spend a day or so. After setting up camp for the night at the town’s full-service campground and taking our daily dip in the community hot pots, we caught the Euro Cup Final at a lively restaurant in town. When it was all over, poor Italy had lost badly to Spain, but things were looking up for us. The strong winds that had plagued us for days had finally blown away, leaving us with beautiful golden light and waters as smooth as glass in the harbor. We enjoyed a leisurely stroll and snapped plenty of pictures of the gorgeously restored wooden fishing boats and their reflections in the mirror-like surface of the water. With all that Húsavík has going for it, it also happens to be the premiere place in Iceland to see whales. Skjálfandi actually means “Shaky Bay” in Icelandic, and it received this moniker for the frequently occurring small earthquakes that happen beneath its waters. Two nearby rivers feed into the bay, collecting lots of nutrients in its bowl and thus bringing over 11 species of cetaceans here to their summer feeding grounds. We signed up for a three-hour tour with one of the many companies in town and boarded our boat Sylvía with high hopes of having some close encounters with some of the many whales that feed in the bay. Visitors frequently see minkes, orcas, and harbor porpoises, but we were crossing our fingers for humpbacks who are generally regarded as the most curious of the whale species. Despite having very good chances of seeing whales (98% of the tours have sightings), there is never a guarantee with nature, and we worried that we might be part of that unlucky two percent as we crossed the bay with no action. It wasn’t until over half way through the tour that Matt actually spotted a few large blows close to the far shore, still several kilometers from where we were. We headed towards the spouts and patiently waited for more signs of life beneath the dark waters, but nothing happened. After a long wait, we all spotted some more blows, farther up the coast this time and again several kilometers from where we were. Moving as quickly as possible, we headed in the direction of the blows and waited yet again for some more action. There was definitely a whale in the area, but it wasn’t acting the way that a humpback normally does. Yes, there were blows, but we hadn’t seen its dorsal fin or the tell-tale fluke that indicates it has gone down for a deep dive like this whale seemed to be doing. When the whale finally reappeared closer to our boat this time, we realized why. What we were seeing was actually not a humpback at all but rather a blue whale! While the blue whale might not put on the most exciting show, it is definitely an event to see one. It can measure up to 100 feet and is the largest animal to have everlived on Earth. Bigger than any dinosaur, it is the size of a ten-story building. Its heart alone is the size of a small car, and its tongue weighs as much as an elephant. A human being could swim through its largest blood vessels. Seeing such an enormous animal emerge from the depths, blow water thirty feet into the air and linger at the surface mere meters away from our boat was an incredible thrill that we will remember for a lifetime. After a few more encounters with the great blue, we headed back toward Húsavík and even encountered a few humpbacks on our way back to town. After disembarking, Matt enjoyed one of his favorite meals in all of Iceland—super fresh take-away fish and chips bought right in the harbor. You can’t ask for any better than that, right? What can we say? We love it when a town delivers. Hooray for Húsavík! Oh how we wish we could remember anything from that Geology class called “Continental Drift and Sea Floor Spreading” that we took at Northwestern to fulfill our science requirements over twenty years ago. If we could, it might explain all the crazy things that we have been seeing in the Lake Myvatn area and how any place on Earth could actually end up looking like this place does. 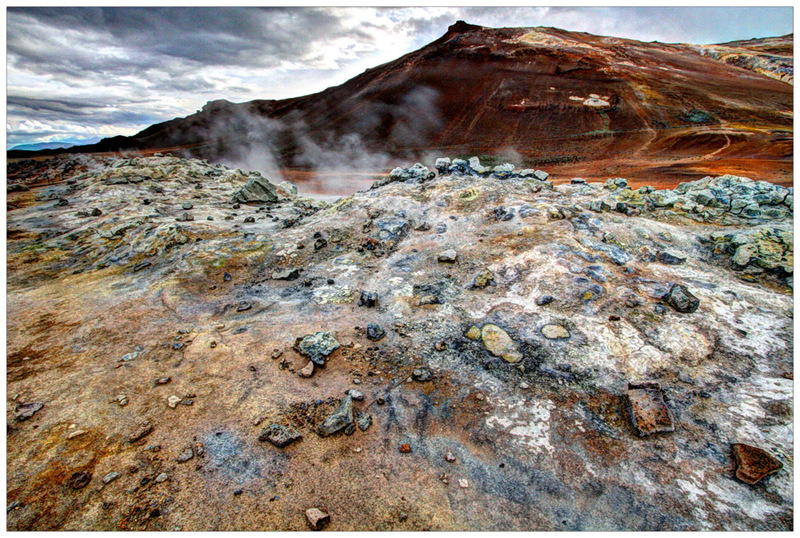 There are rust-colored mountains, large ominous holes in the ground filled with boiling mud, and smoking fields of black lava. We spent a few, very pleasant days here, hiking among the mind-boggling sites and trying to capture the many different species of waterfowl that make the marshes and rivers surrounding the lake their home. After our big day of hiking, we also hit the Myvatn Nature Bath, which is often referred to as the “Blue Lagoon of the North.” It is a natural pool, and its sulfuric ice blue-colored waters set against the volcanic black soil make it a can’t miss destination on the hot pot circuit of Iceland. And, if it couldn’t get any more weird, the Krafla Geothermal Power Station was pretty mind-blowing, too. Since we can’t really tell you much about what we saw, we’ll just let the pictures do the talking. Next time we take a geology class, we promise to pay better attention! 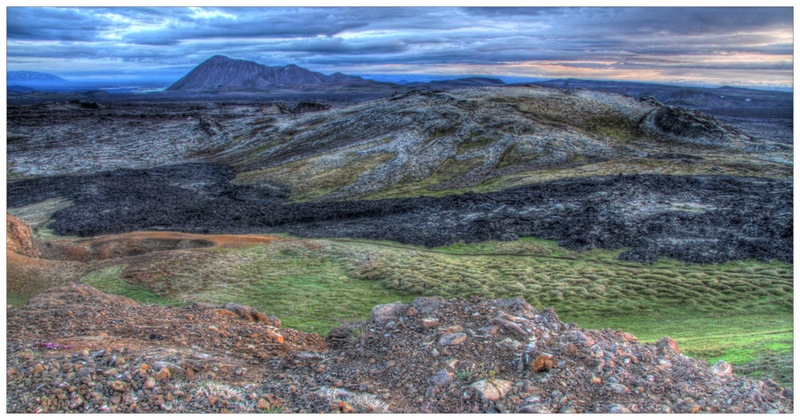 Later on in our trip, we are planning on doing the six-day Laugavegur trek in Southern Iceland. Unfortunately, we are not in any type of backpacking shape at the moment, so we figured we had better do a tune-up hike before attempting such an undertaking. 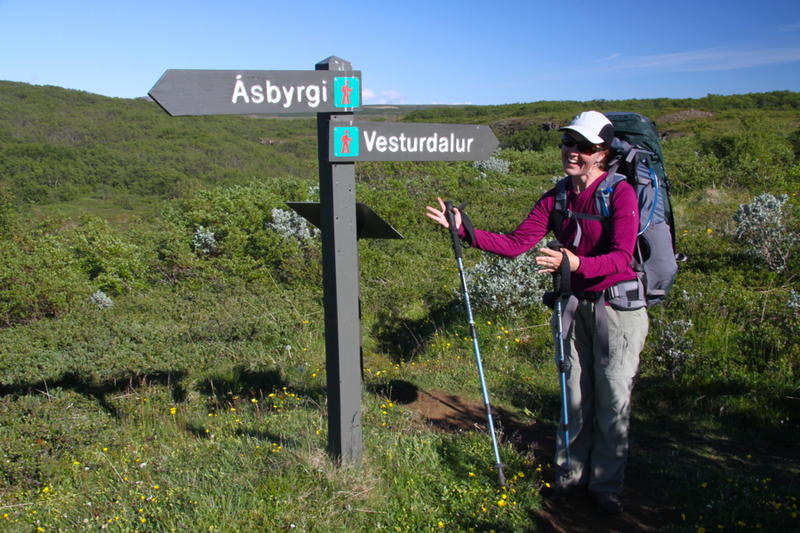 The Ásbyrgi to Dettifoss hike is a two-day, 34-kilometer hike in the northern section of Vatnajökull National Park. You can do it in either direction, but we took the recommendation of Lonely Planet and hiked from north to south. Conveniently, there is a bus that runs between the start and finish, so we left our car at Dettifoss and took the public transport to Ásbyrgi where we would begin our journey. On day one, we arrived at Dettifoss with enough time to have a look at the waterfall before catching the bus north. It is Europe’s most powerful waterfall with an astonishing 193 cubic meters of water flowing over its edge each and every second! It is massive, and just looking at the enormous wall of water plunging over its edge is enough to make you dizzy. It was around noon on a sunny day, and the mist created by the falls produced an unbelievably vibrant rainbow. The glow was so intense that it almost looked like the canyon below was on fire. It was quite a sight to behold! After seeing Dettifoss, we hiked upstream for a few minutes to catch a glimpse of Selfoss, another one of Iceland’s striking waterfalls. After snapping a few photos, we boarded our bus and almost immediately regretted not trying to hitch a ride to the trailhead. It turned out that the SBA bus stopped at each of the major sights along the way, so that passengers could get off and have a look. The strange thing was that each stop wasn’t really enough time to see anything properly but was too much time to sit on the bus and wait to get going again. It took us over two hours to cover 38 kilometers! Once we finally made it to Ásbyrgi, we made a quick visit to the informative visitor center and finally hit the trail. Day One’s walk was pleasant enough, but, if we are being totally honest, it was somewhat reminiscent of tromping through a forest preserve in Illinois. Granted, if we were actually in Illinois, we would have been thrilled to have such a peaceful place to take a good long hike, but, seeing that we were actually in Iceland and not Illinois with 40 pounds on our backs, we were hoping for a bit more. Things started looking up when we got to the edge of the canyon that we would hike along for the majority of the trip. We finally arrived at the campsite around 9:00 or so, pitched our tent and made some dinner before heading to bed. Day Two offered a lot more in terms of scenery than Day One. After a few hours, we descended down into the canyon and walked along a pretty side stream for many kilometers. 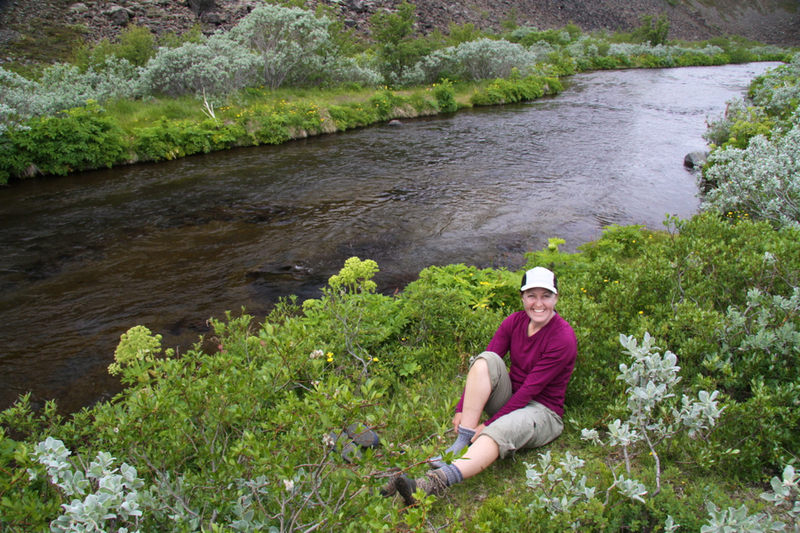 In order to get there, though, we had to ford our first Icelandic stream. We stripped off our boots and socks and put on our Crocs and stared at the icy cold water. We knew that we would have to do this several times on our Laugavegur hike, but this came as a total surprise for us on this hike. Luckily, it looked rather shallow, and it didn’t seem to be too far across to the other side. How bad could it possibly be? Matt set off first. It was a brutal shock to realize that your feet were going quickly numb after the first few steps and that you were only a quarter of the way across. As we dried our feet and feeling started to return, we agreed on an important rule: once you start, don’t stop! Just keep moving and think about those hot pools you can enjoy once it is all done. The remainder of the day’s trek afforded ever-more stunning views of the canyon below with its strange columnar basalt formations thrust up and twisted into natural art that one might find in a modern art gallery. Hiking and photography, we have found, are competing activities that don’t often go well together. So while we had lugged our cameras and a tripod along, the length of the trek and the lackluster light prevented much serious clicking of the shutter. We did, however, stop to capture a set of smaller, picturesque waterfalls, named Holmafossar, which trickled off the rocky plateau above and tumbled into a smaller stream framed by purple and yellow wildflowers. Before long, we were back on the trail and pushing toward the endpoint, the falls at Dettifoss, which send up a plume of mist visible over one kilometer away. Seeing the finish line was all the motivation we needed to press on to the end. With sore feet and joints we took off our boots, stowed our gear, and downed a few ibuprofen, glad to have completed our tune-up hike. Despite the fact that we were exhausted by the hike and nursing sore feet, we opted to pass on the campsite at Dettifoss which was basic and lacked shelter. The trouble was that we were setting off at 8 p.m. with a rather lengthy drive to the next “big” town in the East. Luckily, we decided to follow up on a tip we received from two friendly travelers from the UK whom we met back at Látrabarg. This was a great place to unwind with a cold Skjalfti beer and wash down the trail dust. 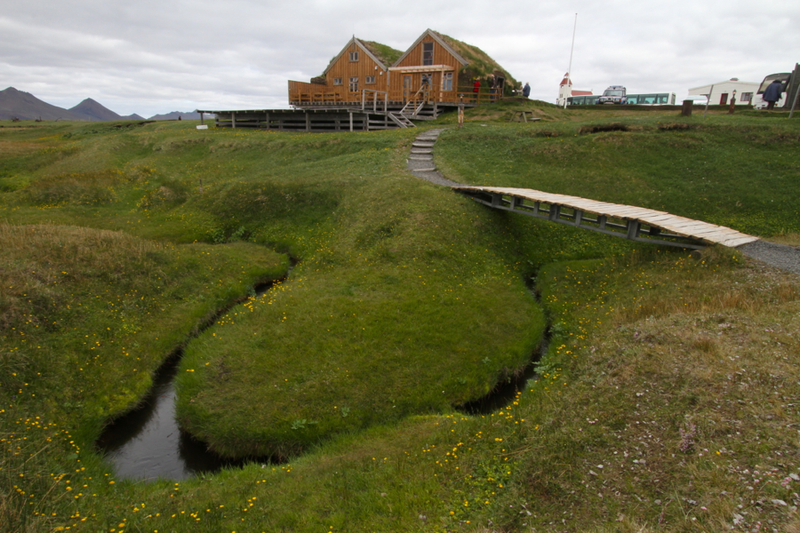 The site also featured a cooking shelter built halfway into the ground in the traditional style of old Icelandic houses. We met a friendly young Icelandic couple on vacation with their two young children and enjoyed hearing their views on the Icelandic economic recovery as we cooked dinner. After photographing the town gas station, church and rusting farm equipment the next morning, we set off along scenic route 901 taking in the stark and sparsely vegetated rhyolite mountains of the interior, reminiscent of the Altiplano of Chile and Bolivia. I am so jealous of you getting to see the big blue! Wow! What were the chances of that? I bet most of the friends to whom you e-mail this are very very jealous of your coats and hats. I drove Judy and David back from Charleston to the mts a week ago. We got stopped by a bad accident just north of Columbia and it was 114 degrees. ONE HUNDRED AND FOURTEEN DEGREES!!!!! I prayed we would not have the AC go out, which, thank God, it didn’t. But the heat has been awful in Chitown and all around. That sounds terrible; thank goodness the A/C held out for you. We actually have had really pleasant weather for the past two days. We did a long hike yesterday in Skaftafell National Park, and it was the first day that we didn’t wear hats or gloves of the entire trip! Yes, Iceland has delivered on a lot of fronts. Do you think a Hobbit house will look out of place in Chicago? 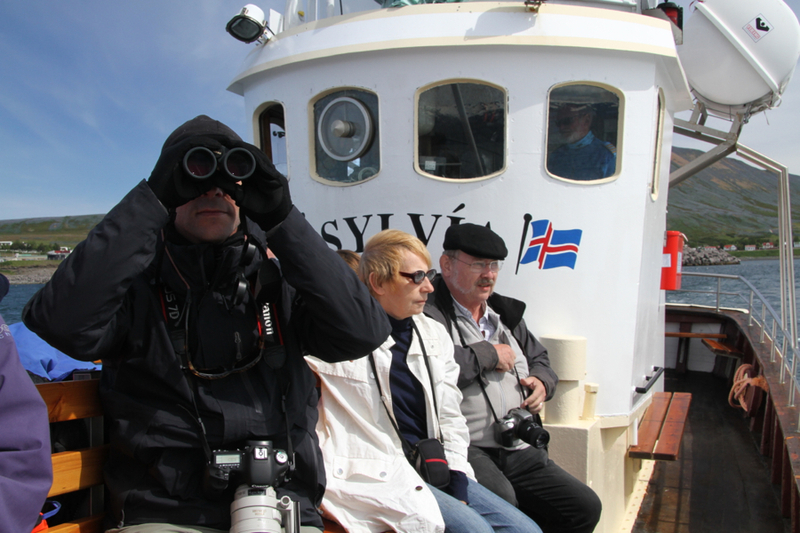 Lucky you seeing the blue whales – we did the tour in June and many tours saw them but not us. I loved the whole experience though. We did feel incredibly lucky. Whenever we miss out on something on a place that we are visiting, we always say that it is a great reason to go back. You’ll just have to plan another trip to Iceland to see a blue whale. Lucky you! Thanks for reading. You look comfortably cool while it’s been in the 90s and 100s around here. Hverir reminds me of Yellowstone. Dettifoss is a little hard to appreciate in the bird’s eye view without the typical stark contrast of flowing water and rocks. The close-up with the people in foreground really give you a sense of the power and volume of the falls. The weather here has been a lot more pleasant than we expected. There have been some really chilly nights, but nothing too bad. Let’s hope the good weather stays for our upcoming trek. We leave in two days!